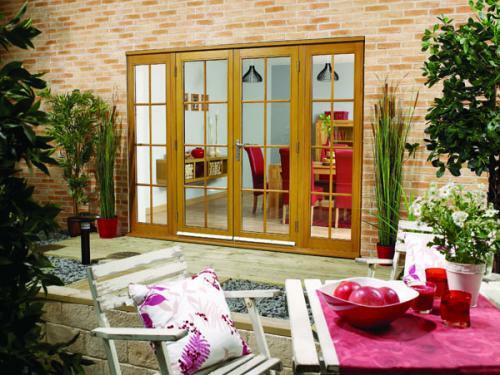 NUVU French doors in fully finished Oak 8 lite are offered to meet the popularity of Georgian effect glazing that provides a more traditional appearance to your property. The traditional bar style is more commonly known as cottage style, so this design fits right into that era but with all the benefits of up to date quality and performance. Our fantastic 8 lite effect option gives you the opportunity to change your design to a more traditional pattern with stick on astragal bars added to the offer, at low cost, for application by you on site. Simple instructions are provided on how to apply. They are supplied in kit form for on- site application . Sets of bars are supplied for both sides of the double glazed units so that you get the bar appearance when looking from either outside or inside.